Ahmed gave own closing argument to "convey the message of God"
ATLANTA, Georgia (CNN) -- A federal judge found former Georgia Tech student Syed Haris Ahmed guilty Wednesday of conspiring to provide material support to terrorism in the United States and abroad. 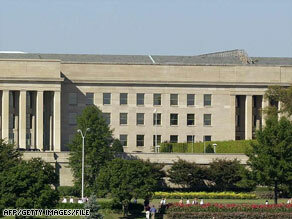 The Pentagon was one of the sites videotaped by Syed Haris Ahmed, the FBI says. Ahmed, 24, could face 15 years in prison. Sentencing has been deferred until after the August 3 trial of Ahmed's alleged co-conspirator, Ehsanul Islam Sadequee, who is expected to face the same charges. U.S. District Judge William Duffey announced his verdict in federal court in Atlanta. The judge scheduled a hearing Thursday to reveal his findings. Ahmed has been held in solitary confinement at the U.S. Penitentiary in Atlanta since April 2006. The month before, he was arrested and indicted by a grand jury. "We were expecting [the verdict], because that was what the system was supposed to do," said Ahmed's father, Syed Riaz Ahmed. He went on to say that Ahmed did not do anything physically, but in the United States, if you think something, you are guilty. Syed Riaz Ahmed said he doesn't believe that his son ever would have carried out illegal acts. The father said his son was misled about his religious identity because of what he read on the Internet and added that he is "proud that [his son] is becoming a better Muslim than others and trying to get other people to follow in the footsteps of the prophet." Defense attorney Jack Martin said he was not "terribly surprised by the verdict. I always thought it was a close case. It could have gone either way." But he said the three years his client has spent in solitary confinement "is enough penalty for what he has done." "Haris Ahmed never posed a threat to anybody. He never was involved in any serious plot or plan, never placed this country in any danger," Martin said. "I look at his face and don't see a terrorist." "Ultimately, this case is really about what is the appropriate sentence for a young man who may have said some things, did some things, but was just a person trying to find himself." Ahmed, a naturalized U.S. citizen who was born in Pakistan, waived his right to a jury trial so he could deliver his own closing argument Thursday. He talked about his Muslim faith instead of addressing the evidence against him. "I just want to convey the message of God," Ahmed said. He cited verses and prayers from the Quran and spent a great deal of time comparing his religion to the Christian faith, noting that both worship the same God. According to Martin, Ahmed "is resigned to what's going to happen and was happy that he could make the statement that he made. That was very important to him." Prosecutors contend that Ahmed and Sadequee traveled from Atlanta to Canada in March 2005 and discussed potential attacks in the United States with three other men they met online. Among the potential targets were oil refineries, a military base and a GPS satellite system, prosecutors said. During an April 2005 trip, Ahmed and Sadequee also made "casing videos" of landmarks in the Washington area such as the Capitol, the World Bank building and a Masonic Temple, said Assistant U.S. Attorney Robert McBurney. Authorities say the short, shaky videos were e-mailed to other co-conspirators. The videos were found on the hard drives of at least two men who were arrested on terrorism charges in the United Kingdom. According to prosecutors, those two men were found to possess a large quantity of "violent jihad materials." Prosecutors also said Ahmed traveled to Pakistan in July 2005 with the goal of entering a terrorist training camp. Martin said Ahmed's family talked him out of going. "This case has never been about an imminent threat to the United States, because in the post-9/11 world we will not wait to disrupt terrorism-related activity until a bomb is built and ready to explode," said David E. Nahmias, U.S. Attorney for the northern district of Georgia. David Kris, assistant attorney general for national security in Washington, added: "This prosecution underscores the importance of international and domestic cooperation in combating terrorism." "The case is not about throwing bombs and shooting soldiers but providing support for those activities," McBurney said in his closing argument last week. "The whole point is to get the terrorist before he gets to flight school and figures out how to fly a commercial airliner," McBurney added. Martin argued that the case should be dismissed. "The evidence is very, very thin," Martin said. The motion for dismissal was denied. Martin had called just two witnesses: Ahmed's older sister and his father. Both testified that Ahmed was searching for his Muslim identity. Throughout the trial, Martin argued that his client is a shy, highly emotional young man. Martin said Ahmed moved to a suburban Atlanta neighborhood with his family when he was 12 years old. He did not have a religious mentor and turned to the Internet to find his identity as a Muslim, Martin said. Martin said there was never any agreement established with co-conspirators, just random thoughts. He said Ahmed's actions were nothing more than "childish fantasies."